Lower right on footwarmer: "P. de hooch"
A mother butters bread while her son stands beside her, his head bent in prayer over the food. He is about to depart for the school seen through the open front door and identified by the sign reading schole. A small triangular niche above the inner doorway holds several books and a candlestick, perhaps alluding to the enlightenment that education brings. A small top lying on the floor in front of the chamber doorway may refer to a Dutch proverb that states a child and a top will both fall idle unless continually "whipped." Education and proper attitudes toward child-rearing were important issues in Protestant countries during the seventeenth century, and many paintings made during this period contain moral overtones and pious references. The use of vertical lines and geometric forms conveys the orderly simplicity of this interior scene. Natural light spills through the front door and onto the tiled entryway. 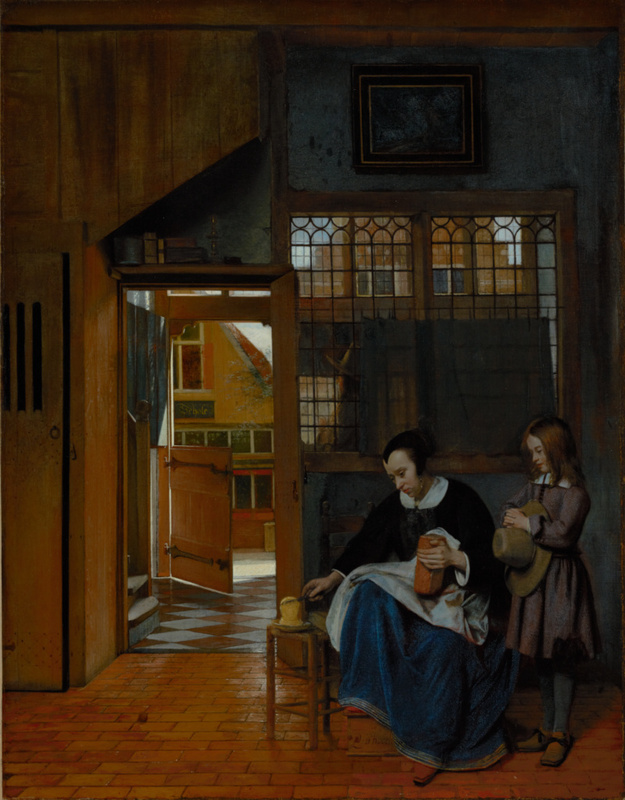 In contrast, the foreground interior is dark, emphasizing a solemn and reverent moment in Dutch domestic life. Johan Gijsbert, baron Verstolk van Soelen, 1776 - 1845 (The Hague, The Netherlands), upon his death, held in trust by the estate. Estate of Johan Gijsbert, baron Verstolk van Soelen, 1776 - 1845, sold to Humphrey Saint-John Mildmay, 1846. Humphrey Saint-John Mildmay, 1794 - 1853 (Shoreham Place, Kent, England), by inheritance to Humphrey Francis Mildmay, 1853. Humphrey Francis Mildmay, 1825 - 1866 (Shoreham Place, Kent, England), by inheritance to Henry Bingham Mildmay, 1866. Lawrie and Co. (London, England) and Colnaghi (London, England), sold to George A. Drummond, 1893. Sir George A. Drummond, 1829 - 1910 (Montreal, Canada), by inheritance to his wife, Julia Drummond, 1910. Source: GRI, M. Knoedler & Co. records, stock book 6, p. 199, no. 14755. M. Knoedler & Co. (New York), 1846 - 2011 (London, England; New York, New York; Paris, France), sold to Andrew W. Mellon, June 1920. Source: GRI, M. Knoedler & Co. records, sales book 11, p. 355, no.14755. Andrew W. Mellon, 1855 - 1937 (Pittsburgh, Pennsylvania; Washington, D. C.), sold to M. Knoedler & Co., 1929. M. Knoedler & Co. (New York), 1846 - 2011, sold to Julius Böhler Gallery, 1929. Source: GRI, M. Knoedler & Co. records, stock book 8, p. 68, no. A522. Julius Böhler Gallery (Munich, Germany; Lucerne, Switzerland), sold to Heinrich von Thyssen-Bornemisza, 1929. Baron Heinrich von Thyssen-Bornemisza, German, 1875 - 1947 (Schloss Rohoncz, Rechnitz, Austria; Villa Favorita, Castagnola, Switzerland), by inheritance to his daughter, Gabrielle Thyssen-Bornemisza Bentinck, 1947. Baroness Gabrielle Thyssen-Bornemisza Bentinck (Paris, France; Düsseldorf, Germany), sold to Edward Speelman, Ltd., 1984. Edward Speelman, Ltd. (London, England), sold to the J. Paul Getty Museum, 1984. Hoet, Gerard. Catalogus of naamlyst van schilderyen met derzelver pryzen: Zedert een langen reeks van Jaaren zoo in Holland als op andere Plaatzen in het openbaar vekogt (The Hague: P.G. van Baalen, 1752), vol. 2, p. 288, no. 4. Smith, John. A Catalogue Raisonné of the Works of the Most Eminent Dutch, Flemish, and French Painters [...]. 9 vols. (London: Smith and Son, 1829-42), vol. 4 (1833), p. 236, no. 54. Waagen, Gustav Friedrich. Galleries and Cabinets of Art in Great Britain: Being an Account of More than Forty Collections of Paintings, Drawings, Sculptures, Mss. [...] Visited in 1854 and 1856, and Now for the First Time Described, A Supplement to Treasures of Art in Great Britain (London: John Murray, 1857), p. 342. Exhibition of Works by the Old Masters and by Deceased Masters of the British School, exh. cat. (London: William Clowes and Sons, 1876), p. 25, no. 205. Havard, Henry. L'Art et les Artistes Hollandais. 4 vols. (Paris: A. Quantin, 1880), vol. 3, p. 96. Weale, W.H. James, and Jean Paul Richter, eds. A Descriptive Catalogue of the Collection of Pictures Belonging to the Earl of Northbrook (London and Sydney: Griffith, Farran, Okeden, & Welsh, 1889), p. 200. Hofstede de Groot, Cornelis. "Proeve eeener kritische bes ven het werk van Pieter de Hooch." Oud-Holland 10 (1892), p. 184, no. 48. Seventeenth Loan Exhibition of Paintings in Oil and Water Colours, exh. cat. (Montreal: Art Association of Montreal, 1893), p. 20, no. 40. "The Bingham Mildmay Sale." The Magazine of Art (1893), pp. 376, 379, ill.
Christie, Manson & Woods, London. Catalogue of The Highly Important Collection of Pictures of H. Bingham Mildmay, Esq. June 24, 1893, p. 16, lot 30. Roberts, William. Memorials of Christie's: A Record of Art Sales from 1766 to 1896. 2 vols. (London: George Bell and Sons, 1897), vol. 2, p. 220. Bode, Wilhelm von. Rembrandt und seine Zeitgenossen (Leipzig: E.A. Seemann, 1906), p. 59. Wurzbach, Alfred von. Niederländische Künstlerlexikon. 3 vols. (Leipzig: Halm und Goldmann, 1906), vol. 1, p. 717. Hofstede de Groot, Cornelis. A Catalogue Raisonné of the Works of the Most Eminent Dutch Painters of the Seventeenth Century, Based on the Works of John Smith. Edward G. Hawke, ed. and trans. (London: Macmillan and Co., 1908-27), vol. 2 (1909), p. 479, no. 10. Valentiner, Wilhelm R. "Die Ausstellung Holländischer Gemälde in New York." Monatshefte für Kunstwissenschaft 3 (1910), p. 5. Inaugural Loan Exhibition held in Connection with the Opening of the New Building of the Art Association, exh. cat. (Montreal: Art Association of Montreal, 1912), unpaginated, no. 71. Rudder, Arthur de. Pieter de Hooch et son Oeuvre (Brussels: G. van Oest & cie, 1914), p. 105. A Catalogue of Paintings from the Collection of the Late Sir George A. Drummond, exh. cat. (Montreal: Art Association of Montreal, 1918), p. 10, no. 32. Christie, Manson & Woods, London. Catalogue of the Well-Known Collection of Choice modern Pictures & Drawings chiefly of the Barbizon and Dutch Schools and Works by Old Matser of the Late Sir George A. Drummond, K. C. M. G. of Montreal. June 26, 1919, p. 51, lot 185, ill.
Brière-Misme, Clotilde. "Un Pieter de Hooch inconnu au Musée de Lisbonne." Gazette des Beaux-Arts 4 (1921), pp. 340-44. Brière-Misme, Clotilde. "Tableaux inédits ou peu connus de Pieter de Hooch (Deuxième article)." Gazette des Beaux-Arts 16 (July-August 1927), pp. 71-72. Valentiner, Wilhelm R. "Pieter de Hooch, Part Two." Art in America 25, no. 2 (1927), p. 76, no. 9. Valentiner, Wilhelm R., ed. Pieter de Hooch: Des Meisters Gemälde in 180 Abbildungen (Berlin and Leipzig: Deutsche Verlagsanstalt, 1929), pp. 64, 275-76, ill.
Knoedler advertisement. The Art News 28, no. 20 (February 16, 1929), p. 5, ill, p. 5, ill.
Heinemann-Fleischmann, Rudolf. Sammlung Schloss Rohoncz: Ausstellung Neue Pinakothek, München 1930, exh. cat. 2 vols. (Munich: F. Bruckmann, 1930), vol. 1, p. 48, no. 158, pl. 56. Bode, Wilhelm von. Rembrandt und seine Zeitgenossen. 2nd ed. (Leipzig: E.A. Seemann, 1934), pp. 83-84. Thienen, Frithjof van. Pieter de Hooch (Amsterdam: H.J.W. Becht, 1940), pp. 36-37. Le Décor de la vie privée en Hollande au XVIIe siècle, exh. cat. (Paris: L'Institut, 1965), p. 27, no. 28, pl. ix. Choix de la Collection Bentinck, exh. cat. (Paris: Institut Neerlandais, 1970), unpaginated, no. 28, ill.
Sutton, Peter C. Pieter de Hooch (Ithaca: Cornell University Press, 1980), p. 90, no. 48. Durantini, Mary Frances. The Child in Seventeenth-Century Dutch Painting (Ann Arbor: UMI Research Press, 1983), pp. 49-50, ill.
Fredericksen, Burton B. "Recent Acquisitions of Paintings: The J. Paul Getty Museum." Burlington Magazine 127, no. 985 (April 1985), p. 265, fig. 102. "Acquisitions/1984." The J. Paul Getty Museum Journal 13 (1985), p. 208, no. 134, ill.
Sutton, Peter C. A Guide to Dutch Art in America (Grand Rapids: Wm. B. Eerdmans, 1986), p. 139, fig. 200. Fredericksen, Burton B. Masterpieces of Painting in the J. Paul Getty Museum. Rev. ed. (Malibu: J. Paul Getty Museum, 1988), unpaginated, no. 26, ill.
Fredericksen, Burton B., et al. Masterpieces of Painting in the J. Paul Getty Museum. 3rd ed. (Malibu: J. Paul Getty Museum, 1995), unpaginated, no. 27, ill., entry by Burton B. Fredericksen. Jaffé, David. Summary Catalogue of European Paintings in the J. Paul Getty Museum (Los Angeles: J. Paul Getty Museum, 1997), p. 61, ill.
Blom, Ad van der, et al., eds. Nederlanse Schilderkunst: Tussen detail en grandeur (Alphen aan den Rijn: Atrium, 1997), pp. 107-10. Sutton, Peter C., ed. Pieter de Hooch, 1629-1684, exh. cat. (Hartford: Wadsworth Atheneum, with Yale University Press, 1998), pp. 138-39, no. 24, ill.
Sampiero, Dominique. Femme buvant dans une cour: Pieter de Hooch (Paris: Les Flohic Éditeurs, 1999), p. 56, ill.
Vergara, Alejandro, and Mariët Westermann, eds. Vermeer y El Interior Holandés, exh. cat. (Madrid: Museo Nacional del Prado, 2003), pp. 49, 122, 214, no. 13, ill.
Buvelot, Quentin, et al., eds. Frans van Mieris, 1635-1681, exh. cat. (The Hague: Royal Picture Gallery Mauritshuis, 2005), p. 78, fig. 3b. Meijer, Bert W., et al., eds. Vermeer: La Ragazza alla Spinetta e i Pittori di Delft, exh. cat. (Florence: Giunti, 2007), p. 97, pl. 14; pp. 129-30, no. 14, ill., entry by Raffaella Colace. Doherty, Tiarna, and Anne T. Woollett. Looking at Paintings: A Guide to Technical Terms. Rev. ed. (Los Angeles: J. Paul Getty Museum, 2009), pp. 56-57, ill.
Loughman, John. "Domestic Bliss? Images of the Family and Home in Seventeenth-Century Dutch Genre Art." In Images of Familial Intimacy in Eastern and Western Art. Nakamura Toshiharu, ed. (Leiden: Brill, 2014), pp. 80-90, fig. 3.7. Toshiharu, Nakamura, ed. Images of Familial Intimacy in Eastern and Western Art (Leiden: Brill, 2014), p. xiii, fig. 3.7.